This is Jeopardy! Answer: This country is home to the engineering marvel that provides passage for nearly 14,000 ocean-going vessels per year. Question: What is Panama? Answer: This company makes it easy for you to travel to Panama by handling all the details for you. Answer: What is Monograms? That’s right, Monograms handles the details, so all you have to do is show up for this 6-day vacation. We’ve arranged your hotel reservations, sightseeing, daily breakfast, two lunches, and transportation between destinations. Plus, you’ll have the services of a Local Host®, someone who can let you in on little-known secrets, answer questions, offer suggestions, and help you personalize your trip. All you have to do is have fun! Your vacation begins in Panama City, where we can seamlessly pick you up at the airport for a transfer to your selected hotel. At your hotel, your Local Host will welcome you with a warm greeting and present you with the materials you need for your vacation. The next morning, after an included breakfast, we will pick you up at your hotel for your exclusive sightseeing tour with a local expert. You’ll hear the inside stories and fascinating history of Casco Antiguo, founded in 1673 and a UNESCO World Heritage Site. Be sure to ask your Local Guide for the best place to capture photos of the colonial buildings and historical monuments. Of course, you can’t visit Panama and not see the Panama Canal, an engineering marvel like no other. That’s why we’ll take you to the Miraflores Locks Visitor Center, where you’ll learn about the canal’s construction and see vessels transiting through this engineering marvel. And that’s not all…we have included a partial transit of the canal, where your ship will sail go through two locks and be lowered 90 feet to the Pacific Ocean! Then it’s time to relax. We’ll take you via private transfer to Gamboa Rainforest Resort in the heart of Soberania National Park. Take a cruise up the Chagres River in a dugout canoe to visit an Emberá Indian Village, where you’ll witness ancient Emberá cultural dances and learn about their mystical rituals and knowledge of medicinal plants. You’ll even get lunch in the village! In Gamboa, you’ll have plenty of free time to take advantage of the many activities, like an aerial tram tour, kayaking, fishing, birding or monkey tour, or just relaxing by the pool or at the spa. Monograms includes all of this in your vacation package. Between the sightseeing we’ve arranged, the hotels we have booked, and the transportation we’ve included, we have saved you the cost of your time and the stress to put it together on your own! We do the work so you can just grab your swimsuit and camera, and head to Panama! Located in northeast Panama, the area is a series of islands and includes the Bastimentos National Park built to protect the natural wildlife of the area. 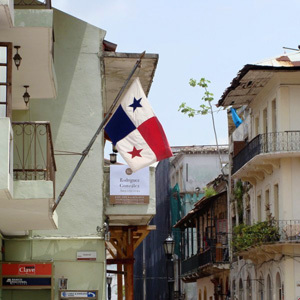 Gamboa, Panama, was originally built to house employees of the Panama canal. The small town’s main attractions are its proximity to significant tracts of relatively undisturbed rainforest, and Pipeline Road, considered one of the best bird watching sites in Central America. It is at the very heart of the Americas that we find the Isthmus of Panama, the narrowest isthmus in Central America, and the Caribbean countries to carry out an exchange of their cultural and commercial activities. It was in 1914, when the 20th Century was beginning, that US citizens finally built a transoceanic Canal through the Isthmus of Panama, adding two terminal ports, Balboa and Cristobal, located in the Pacific and Atlantic coasts respectively, to its route. Then, with the scientific advances of the 20th Century and the start of international flights, airport services were improved throughout the country with the building of a totally new international air terminal with all the comforts and up-to-date improvements in passengers service and cargo handling. There are eight kilometers of land that separate the deep waters of the Caribbean Sea to the North of the Pacific Ocean to the South. This condition was more than enough for the 16th Century Spaniards to declare that the Istmus was “the key to the Americas.” Panama is much more than just a canal. You find, whatever you desire, for it is a cosmopolitan, country, full of pleasant surprises. Visitors to Panama have been able to discover things that defy the most outlandish imagination. Today, Panama finds itself at the threshold of a new era, with its citizens eager to work for and invest in their country. Panama is moving to the forefront, which is evidenced by the opening of new businesses every day that work in time with truly progressive economy.